The Toshiba SSH 140 ultrasound is a comprehensive, all-purpose ultrasound system suitable for a wide variety of clinical applications, including cardiac, pediatric, abdominal, and urology applications, as well as small parts ultrasound, to name a few. In addition to its 10-inch high-resolution monitor and touchscreen controls, the Toshiba SSH-140 also can store information on up to 250 patients and it includes several pre-programmed functions. 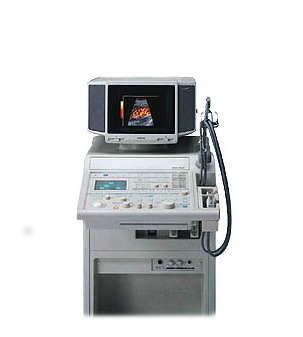 As such, the Toshiba SSH-140 ultrasound aims to help operators scan patients faster and with greater efficiency. With regards to its imaging performance, the Toshiba SSH-140 uses high Doppler sensitivity and technologically advanced dynamic beam control to provide superior quality images.